Top notch golf courses, outdoor activities and big business are at our doorstep. 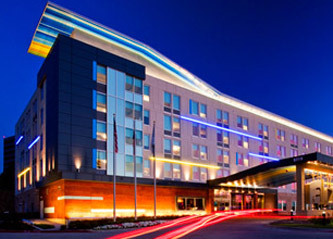 The Aloft Las Colinas Hotel, a vision of W Hotels, the new place to stay and play while in the upscale suburb of Dallas. Top notch golf courses, outdoor activities and big business are at our doorstep. While you’re here take some time to mingle in our re:mix lounge or w xyz bar which are abuzz with energy day and night. Enjoy signature cocktails and tasty bites while you play a game of pool, listen to our DJ"s spin your favorite tunes or surf the internet with our complimentary high speed internet access. Enjoy the comforts of our ultra-comfortable signature bed, oversized showerhead, custom amenities by Bliss Spa and more. Our plug & play connectivity station charges all types of electronics and links to the 42" LCD TV to maximize work and play.